Status: Active. BCGS Cemetery Records updated May 28, 2008. 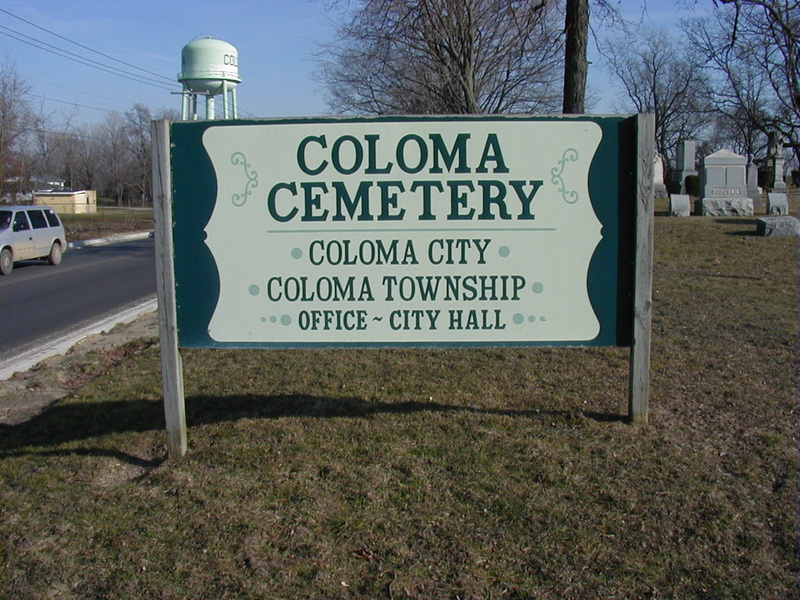 Unlike all the other townships in Berrien County, Coloma has only one cemetery. Transcribed from 1972 to 1975 by Helen Hilliard, James Hilliard, Joseph Wells and Marjorie Wells, with assistance from Carole Kiernan, Lois Wier and the Davidson Funeral Home, Coloma Cemetery is the final resting place for many pioneer citizens and veterans. The transcription in 1975 came up with almost 2,500 headstones. The first burial in Coloma Cemetery was that of Alice A. Bryant, daughter of Mary L. and Delos Bryant. She died August 19, 1848 at the age of 19 years. One noteworthy couple buried in Coloma Cemetery are, George Washington Carter and his wife Amelia. They were a well-liked African-American couple and former slaves who were written about in “Trails From Shingle Diggin’s” by Mabel Branch Stark. George Washington Carter worked as a janitor in a bank and Amelia worked at several restaurants and cleaned homes. In 1926 there was a fire in their home on North Street late one evening. Bystanders stood and watched as their home became engulfed with flames. Firemen were called and found George already dead but carried Amelia’s unconscious body to Ernie Kittell’s home, next door, where they were instructed to lay her in the bed. When she woke sometime later she apologized for “soiling” their bed. Amelia Carter did recover with the help of the Kittell’s and lived a few years longer but is now laid to rest in Coloma Cemetery. A new feature of Coloma Cemetery is the addition of Columbariums, which are also found in Riverview Cemetery in St. Joseph Township. Starting in September of 2002, 48 granite compartments were installed with each compartment measuring 8 inches wide by 3 inches tall. The compartments are used for urns containing ashes from a cremation and is the new alternative to in-ground burial. The Cemetery Board purchased the columbarium for $9,359. The three-tiered Columbarium can be found in the southwest corner of the cemetery.